Your new puppy can be relatively easy and very successful if you devote the appropriate amount of time and patience to the task. 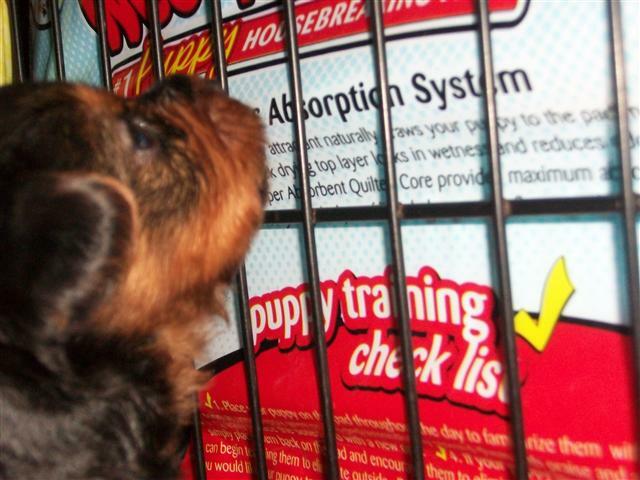 A successful puppy training plan includes supervision, confinement, encouragement and lots of opportunities to succeed. Your first task will be to teach your puppy where you want him to eliminate (go to the bathroom) by accompanying him every time he goes outside. Select a specific area where you want him to go that is easy to get to, i.e., close to the door! Your puppy will become familiar with this place as he recognizes his odor from previous eliminations. You should gently praise his sniffing and other pre-elimination behaviors. Make sure to energetically praise your puppy after he eliminates in the proper area. 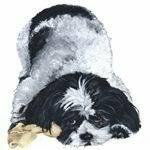 You may want to offer a treat to your puppy as soon as he finishes eliminating (reinforcing the behavior of eliminating in the appropriate spot). 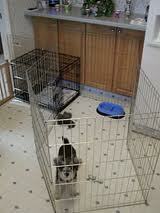 to directly supervise your puppy, confine him to a small, safe area. This can be a room or a crate. Always take him outside to eliminate just before you confine him. You may want to use a wire or plastic crate to confine your puppy when you can’t directly supervise him.If you are leaving your puppy home alone every day for long periods, you may want to consider hiring a dog walker so there are no unexpected accidents. Teaching a puppy to eliminate on papers or puppy pads gives your puppy an extra confusing step. Successful house training requires frequent outdoor bathroom breaks. Figure an hour for each month of age and add an additional hour to the total to determine the frequency of potty breaks your puppy needs. 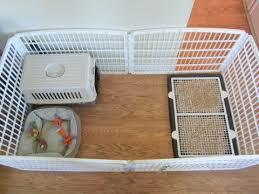 For example, an 8-week-old puppy can stay in the crate for three hours. The most amount of time any dog should spend in a crate is 8 hours. 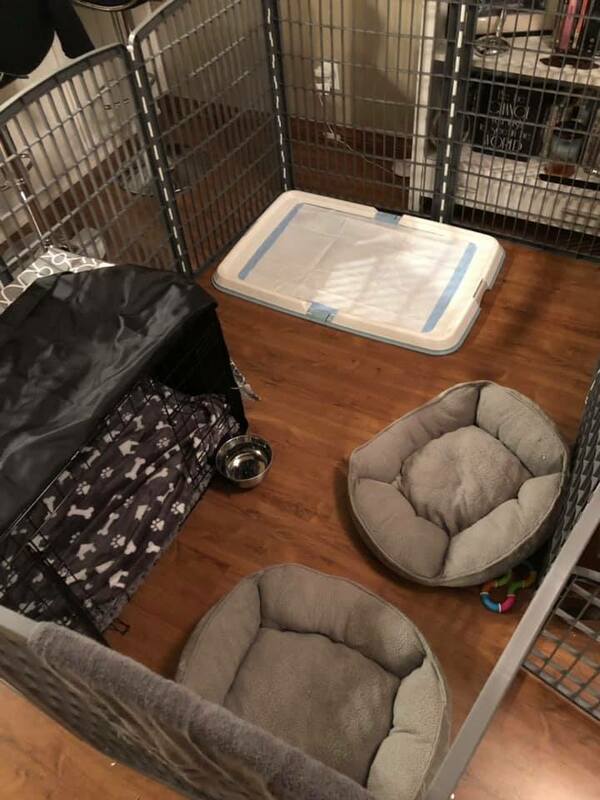 Help your puppy become comfortable in his confinement area by having toys and treats in the area, playing with him in this area, or simply being in the room with him while he rests. training your puppy can be a rewarding and bonding experience for both you and your puppy. Be sure to contact your veterinarian with any questions or concerns you may have during this important training process. This is so important in the beginning. Once done right, you'll never have to worry. Despite what all the other books say, which we found to be not quite right, housebreaking a little dog is a whole new story. First, establish you’re routine. This involves you and other family members. We are creating a Task Chart for this soon. But, for now, you'll need to schedule who does what & when. Puppy needs to get back on track with going on newspaper or wee wee pads. Puppy is going regularly on newspapers here. But, once they get into a new home....they think they can do whatever. Everything is different for them and everyone is loving them up may distract them from what they're use to. So, don’t let those big brown eyes fool you. They need your loving along with training from the get go. Housebreaking should be renamed room breaking. Because, that’s where little dogs begin. Puppies under 6 months old may be unable to control their bowels reliably. Here's our BIG-Housebreaking Tip for teacup - small dogs that the books don’t tell you because they are coming from a beagle or lab puppy standpoint. They're forgetting about the "lost in space issues"). TAKE AWAY PUPPY'S FREEDOM. And do the "Puppy Set Up" (illustration bottom of page). Puppy needs to go ASAP on the new schedule along with rewards and discipline. Puppies have a body clock that tells us when they need to go. First thing in morning, after eating, after taking a nap, and before bed. This is hard in the beginning for sure, but it's temporary. And, when you see results it gets easier. People must be determined to tough it out with this schedule. Sometimes, housebreaking can be made easier with an existing family dog that is already housebroken. Just take them out together as much as possible. 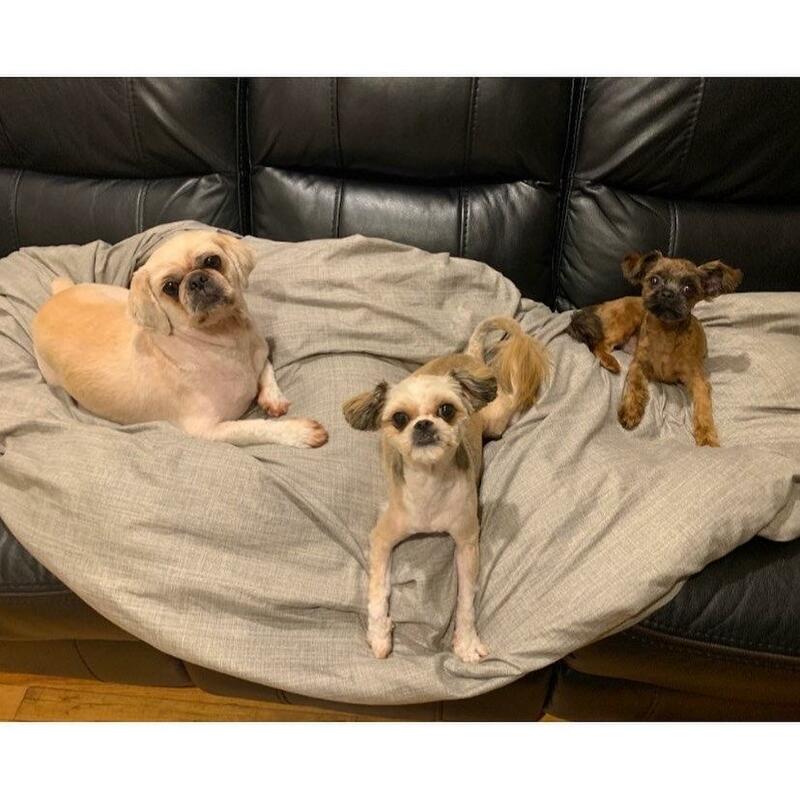 In general- Housebreaking can be challenging if one doesn’t have education in housebreaking technics with teacup to small breed dogs. The # one reason people surrender their dog to human society is because of housebreaking issues. Anyway, in time- the newspaper area can be transported to wherever you decide forevermore. This could be right outside for warmer climate homes. 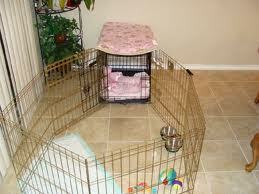 Some condo or apartment dwellers have been pretty ingenious in creating areas for puppy or dog to go. Such as: 1.) use a x-large kitty litter type plastic tray with higher sides filled with newspapers. Can be stored in closet or laundry room. 2.) Use an old large wood end table or coffee cabinet with doors underneath for storage: remove doors and install a swing doggie door. Paint inside with a water repellent paint or line inside with hard plastic board. Store the newspaper tray inside. Some use a puppy litter but its expensive-about 10.a bag. Never use actual kitty litter for a puppy. 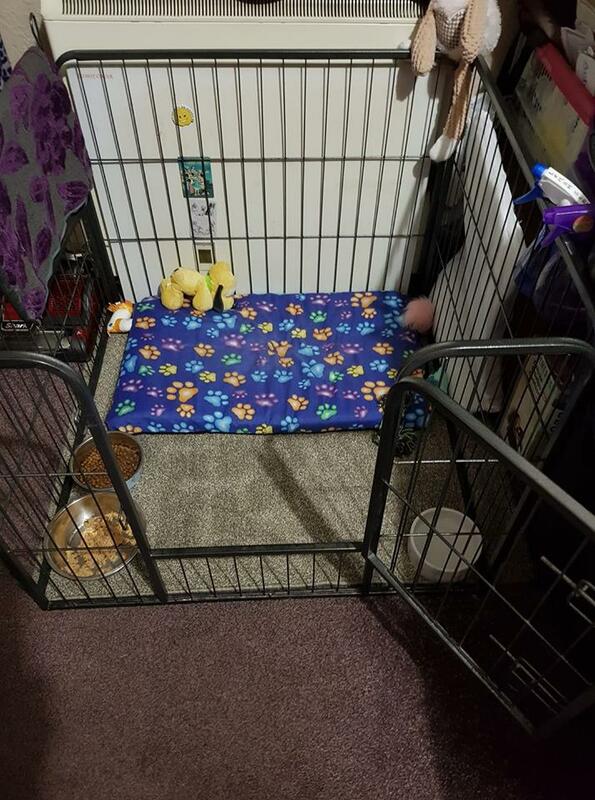 Also, you can buy a similar little dog kennel made out of wicker. And, there's wood dog kennels made to look like furniture. OR if you’re in the colder climate weather: many prefer the attached garage with child's small swimming pool filled with sand or newspapers. Treats are going to be a big incentive for puppy to go outside in all kinds of weather conditions. A covered area would be good to for snow and rain. We think a simple fenced off area in the yard itself is good so, puppy or dog is not going all over your yard. Especially, when the kids will be involved. Link to modern puppies pet supplies click on brown button for fast and easy training crate.